This is Eric Werner and his friend Andrea. 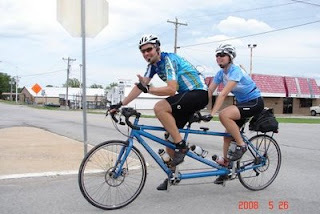 They have just completed a cross-country bike ride across the USA. Immediately afterwards they traveled to Iowa. Frank and Karla have flown there this weekend and this Sunday morning began RAGBRAI, or Register's Annual Bike Ride Across Iowa. Seven days and 472 miles across the state from the Missouri river to the Mississippi river averaging 68 miles a day. Frank and Karla have been spending more time on the bikes training for the event and just bought new bikes a couple of days before the Smile Triathlon a couple of weeks ago. I'm sure they will have a grand time touring the state with Eric and the rolling weeklong party. And a totally different adventure is underway for Boogieman Doug Dawkins. 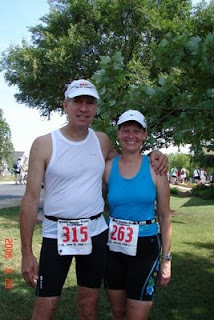 Doug is a founding member of the Mangum Track Club and race director of the Boogie and the Ellerbe Springs Marathon. Doug is now recently retired and has begun a lifelong dream of running across the country. You can go to his blog for the details of his route and schedule. This will be a mostly self-supported run for Doug. He is carrying a light pack and will replenish along the way and sleep wherever he can find a place to lay his head. As he travels through NC he will have many friends to meet him and possibly crew for short periods but as he moves further west there will be some lonely days on the road. If you have friends or family that are close to the route he is following please contact them and see if they might be willing to offer some encouragement and possibly a little help. Doug would welcome some company along the road as well as an offer of a soft bed and shower occasionally as well as some home cooking. I also have a link to his blog in the sidebar so you can find it easily for further updates of his adventure.